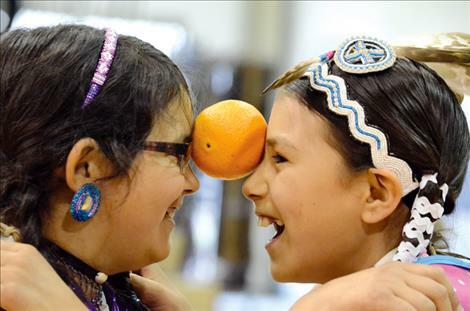 Gracie Dumontier, 10, and Cedar Hunt, 10, compete in the orange dance. 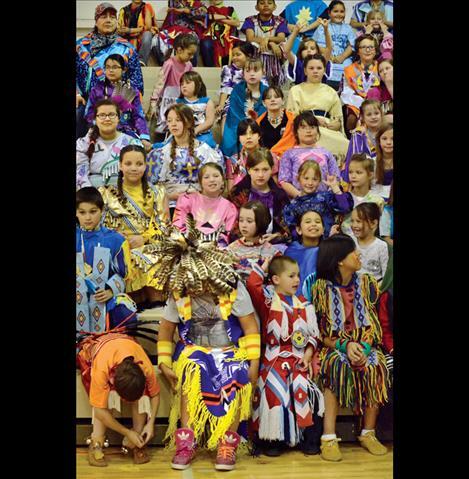 Students and guests wait for the powwow to begin in the Mission High School gym. 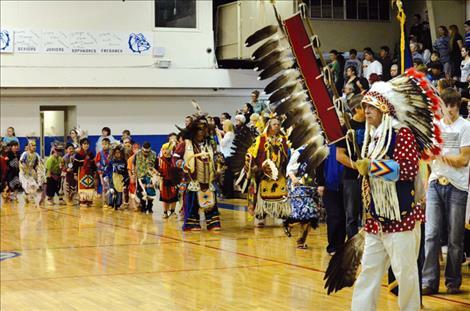 ST. IGNATIUS – Students in St. Ignatius schools celebrated their annual cultural day Friday with a slew of Native American activities, which by coincidence was the same day the Confederated Salish and Kootenai Water Compact was signed. 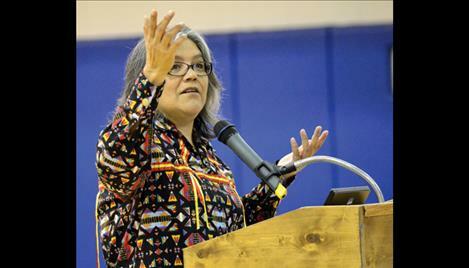 “Today in Helena, the governor is signing the water compact,” St. Ignatius Tribal Council Representative Patty Stevens said on Friday in a speech to the students. She explained that she didn’t go to Helena because she had already promised to speak to the students before the date was set to sign the compact. In her speech, she defined culture. Stevens shared some of the traditional ways she lives her life as an Indian, including digging bitterroot. She said the introduction of alcohol and sugar caused problems for people in her culture. She encouraged all students to avoid alcohol. “The greatest destruction to our bodies: sugar and alcohol,” Stevens said. She said respect was the best way to honor any culture. “Be respectful to each other, to the water and to the land,” she said. Dan Decker was invited to speak about his experience as a Native American attorney. He talked about how the Hellgate treaty established the reservation, and he said a violation to that treaty opened the area up for homesteading. “As a result, we have this melting pot today,” he said. Decker talked about the importance of finding a way for cultures to exist together. He moved on to say that respect was an important tool for getting along. “It’s about being good to one another,” he said. Decker explained how Native American beliefs have affected government. “This is the first tribe in the nation to declare a tribal wilderness area and also the first government to protect the grizzly bear. That’s government reacting to cultural beliefs,” he said. He ended with a message he borrowed from Chief Joseph about raising kids. The students participated in workshops during the day. Ben Corral taught Stick Game. 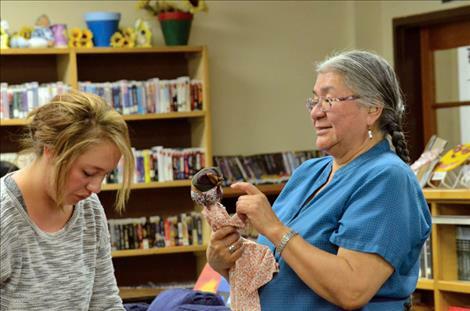 Mary Jane Charlo helped students make Yaya dolls, and John Matt helped students learn a few Salish words. 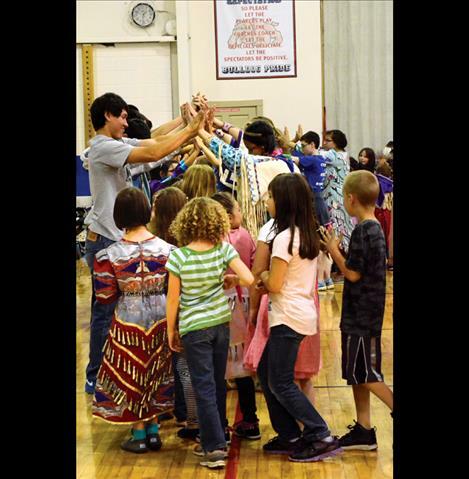 Paul Phillips, Salish Kootenai College Native Games Specialist, taught students how to play Stick Ball with help from Mike Tryon. The day finished with a short powwow. “We started this cultural day a few years ago to share our culture. 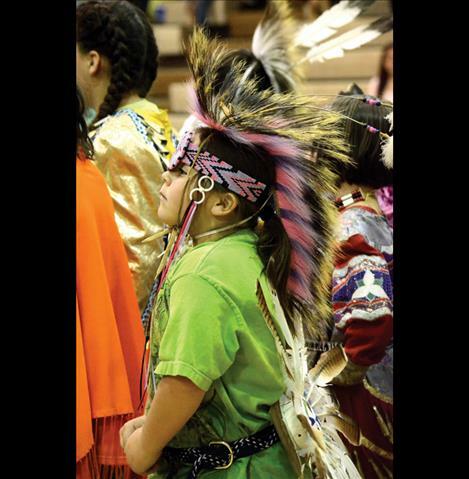 It has grown bigger every year,” said Geraldine Felix, Native American Studies teacher.